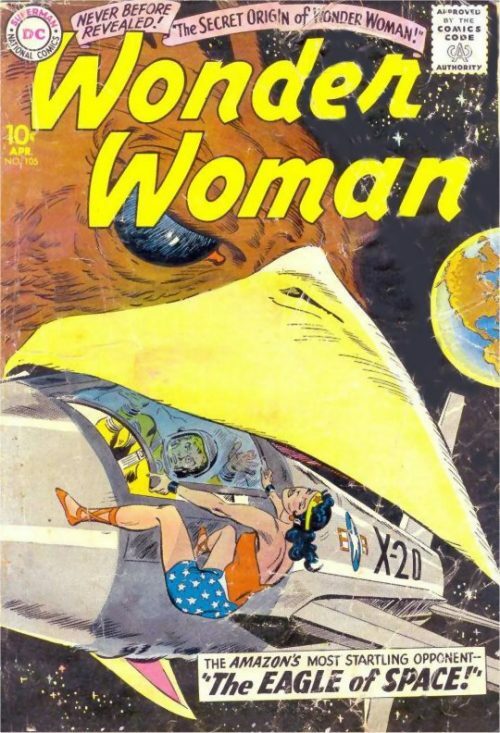 This issue harks back to a more Golden Age feel with its fantastical elements, as Diana travels across time and space to summon the aid of legendary heroes from history. Dawn breaks and I Ching together with one of the Amazons brings a pensive Diana some refreshment after her all night vigil. The Amazon Princess tells her mentor that she has still not figured a way out of their predicament. He tells her that she needs to eat to keep up her strength and although she is not hungry, she knows he is right. As she sips from a bowl of broth, I Ching muses that if they were in one of those American Westerns shown at the cinema, just about now the cavalry would come charging over the hill to save them! On hearing this, Diana lets out an exclamation of delight and thanks the bemused Chinaman for his unintentional inspiration! She tells him that she knows exactly where she can find this “cavalry”. I Ching asks where on earth she will find such help and whether she is sure they will want to aid the Amazons. Diana replies that they will want to help because they are heroes – old heroes – and that is what heroes do – they help those in need! She then leads him back to the camp and instructs one of the guards to summon the captains together. She also requests for Druscilla, the messenger, to report to her tent. Soon an excited Diana explains to her captains what she has planned. She intends to journey to the other dimensional worlds where the old heroes live – namely Roland, Siegfried, El Cid, Lancelot, Arthur and all the others. She will ask for their help and being the kind of men they are, they will come! Together, they and the Amazons will defeat the army of Ares. 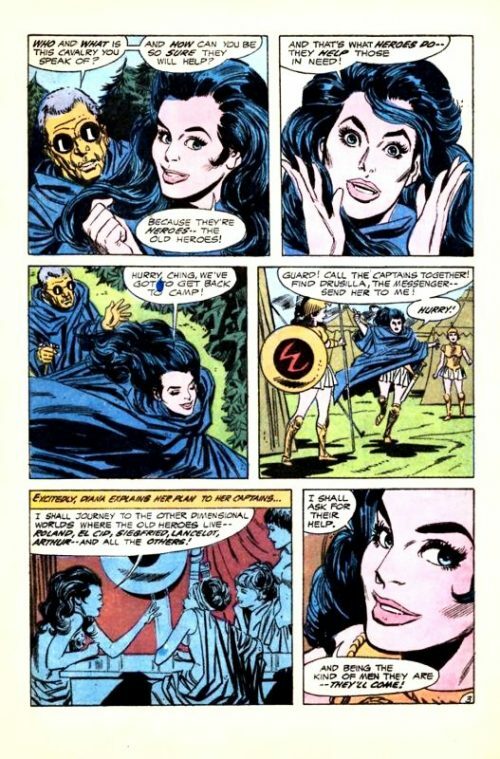 Just then Druscilla arrives and Diana asks her if she still has the magical Amulet that enables the Amazons to travel to other dimensions. She nods and the Amazon Princess briefs the captains on what they must do while she and Druscilla are away. They will need time to gather the heroes of old and she is relying on the Amazon warriors to buy them that time – with their very lives if necessary. She instructs them not to meet Ares’ forces in pitched battles but to fight via ambush attacks. They should block the narrow mountain passes with avalanches and do anything and everything possible to hold the attackers off until Diana returns with help. With the orders given, she and Druscilla then use the Amulet to travel through the dimensional portal, across time and space to the world of King Arthur and Camelot. They arrive outside the walls of the magnificent castle and join the crowds who are entering the gates to watch a Tournament being held inside. Druscilla tells Diana that the Gods must be smiling on them as this means that all of the heroes will have gathered here to take part. The Amazon Princess agrees and says that they should hurry, as the sooner they speak with them the sooner they can accompany the two Amazons back to Paradise Island. Eagerly and with hearts high the two women plea for an audience with King Arthur but nobody seems to pay any attention to them. Frustrated and with time running out Diana decides to take matters into her own hands and strides resolutely out into the arena, interrupting a jousting match. Amid angry cries of disbelief from the watching crowd, she walks between the two duelists and up to the royal box. King Arthur demands to know who she is and why she is here. 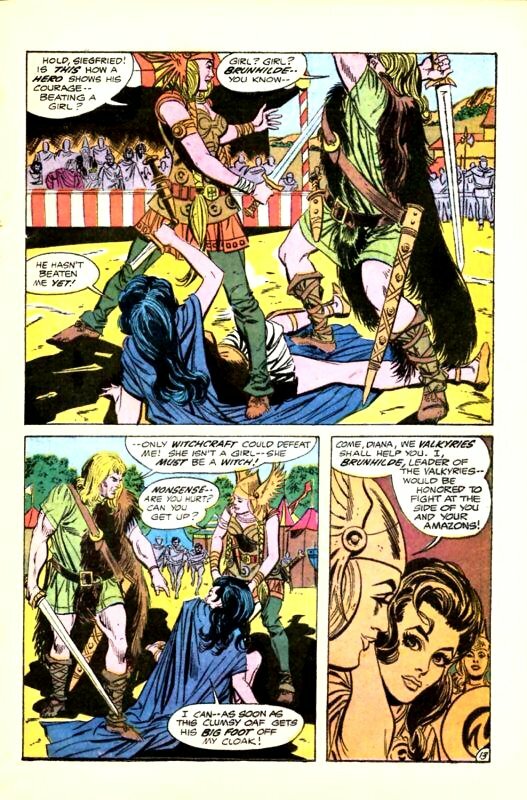 Siegfried, who sits by his side, comments on her comeliness as Diana tells the King that she is the daughter of Hippolyta, Queen of the Amazons. She is here to ask for both hishelp and the help of the other heroes gathered here today. He asks her why she seeks such help and she states that they are the legendary heroes of old, who always come to the aid of those in need. Siegfried retorts that they normally end up coming to the aid of the ungrateful…whining cowards who plead for help to get out of the mess they have got themselves in to! They then promptly forget the heroes who have helped them once they are no longer needed! King Arthur asks each hero in turn what they think about Diana’s request. Roland replies that the Amazons are not worth his sacrifice. Siegfried agrees and asks for more wine. Lancelot tells Diana to return home and not to make trouble. Arthur then tells the startled Diana that the heroes have spoken and Siegfried adds that anyway, nobody needs heroes when war is done. Diana responds that War is not done! Her grandfather, Ares, God of War, has unleashed the hounds of war again and wants to learn the secret of dimensional travel from her mother. That is why he is making war upon the Amazons. Ares wants to bring death and destruction to Earth and other worlds – perhaps even theirs. She and her Amazon sisters have fought and fought until they are almost spent. They cannot win unless the heroes of old assist them. They are needed right now and she pleads with them again to join battle and fight at her side against Ares. But the heroes are adamant. They are done with war! No more will they bleed and die for nothing. They are heroes – not fools! A shocked Diana stares dumbfounded, hardly able to believe her ears as she is told again to go away and let them carry on with their tournament. Angrily she leashes out, knocking Siegfried’s cup from his hands and yelling that they are not heroes at all, but simply children playing at games while her world burns. They are a disgrace! A furious Siegfried rages that her insolence must be punished and puts his hand on her shoulder as she turns to leave. Diana grabs it and before the startled Siegfried knows what is happening she hurls him over her shoulder. But quick as a cat his powerful muscles bring him leaping back up to his feet, roaring with anger as he draws his sword. Diana’s Karate trained reflexes save her life as she uses her own sword to block his attack. She then puts on a fiery display of swordsmanship as the astonished crowd whoop with glee and delight, watching this mere slip of a girl drive the mighty Siegfried back! But as she advances her foot momentarily slips and she stumbles to the ground. Siegfried’s sword plunges down and smashes her own sword in half as she uses it to block his swing. Berserk with rage, he raises his weapon for the killer blow but finds another blade suddenly appear in front of his face. A woman warrior dressed in Valkyrie armour tells him to stop his attack for surely this is not how a hero shows his courage – by beating a girl? Siegfried recognises the woman as Brunhilde and snarls that she knows full well only witchcraft could possibly defeat him. Diana must therefore be a witch! As Brunhilde helps the Amazon Princess to her feet she tells Siegfried he is talking nonsense. She then asks Diana if she is alright. Diana nods and Brunhilde tells here that she and her Valkyrie warriors will be honoured to help the Amazons in their struggle against Ares. A strangely silent group of heroes watch as Diana, Druscilla and Brunhilde walk off to battle. As they go, the Valkyrie leader asks Diana to try and understand why the heroes are behaving like this and forgive them. For centuries they have seen war after war fought to supposedly end all future wars. To them, their sacrifices have all been in vain. 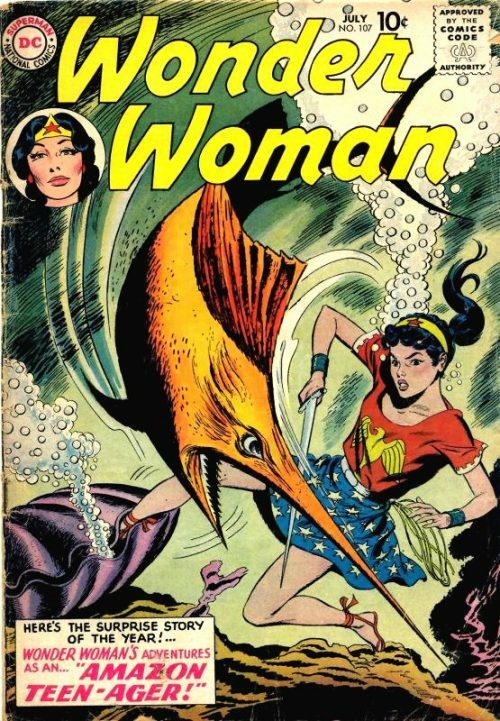 Diana replies that she realises this but without them the Amazons are lost. They must understand that it is heroes like them who must and do rise at each time of crisis to fight on the side of right. Brunhilde says that they will not come as they are convinced that their heroism has been futile and useless. Diana disagrees, replying that their acts were never futile. It is because of them and the example they and others like them set to make the world a better place that she and the Amazons do what they do now. They must help! But in the end it is only Diana, Druscilla and Brunhilde, leading a long line of Valkyries, that make the dimensional trip back to Paradise Island an hour or so later. They arrive just in time to send their flying horses crashing into an enemy advance that has breached the Amazon wall of shields. 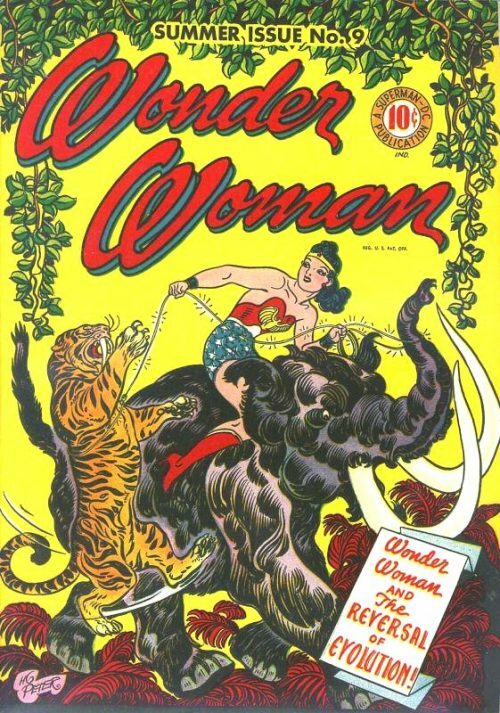 Deadly swords and deadlier hooves send Ares’ men reeling back as the Amazon defenders raise a cheer at Diana’s return. What seemed to be certain defeat becomes victory! Amazon and Valkyrie drive forward together and the enemy retreat becomes a rout! That night, Diana, Brunhilde and the Amazon captains discuss the following morning’s battle plans. Each woman in her heart of heart knows that tomorrow will almost certainly end in defeat and death for them all. Long after the others eventually retire for a few brief hours of sleep, Diana sits by her mother’s bedside. 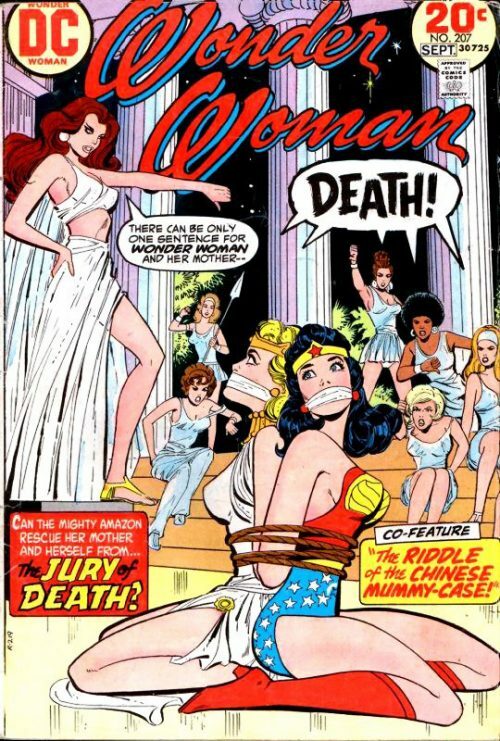 She tells the sleeping Hippolyta that she and the other Amazons have done all they can and that tomorrow they shall fight for one final time. But in losing the battle, Ares will lose too, as she swears that the War God will never learn the secret of dimensional travel from the Amazon Queen. She knows that she will have to kill her own mother – just as Hippolyta would expect of her – in order to prevent endangering the Earth. The next day at dawn the Amazons and Valkyries watch as Ares sends every one of his legions against them across the plain. As the tide of beast men, barbarians and Ares’ own hordes smash against their thin lines, Diana’s cry rises above the din of battle. “Fight well..and if we must…die well!”. The fight is furious and ferocious. For every one Amazon or Valkyrie that falls, ten of the enemy die. But still they come…on and on. They drive the women ever backwards until they can retreat no further. As Diana and her remaining warriors prepare for the last battle though they hear a noise like thunder accompanied by the sound of a distant horn. As they peer at the horizon they see horsemen charging towards them. It is Roland, blaring his horn and leading the charge as the other heroes, lances levelled, charge towards Ares’ army. Nothing made of flesh and blood withstand the onslaught and the forces of the War God hold for but a moment – before wavering and breaking! Caught between the steel jaws of the Amazons and Valkyries and the armoured juggernaut of Roland, the army of Ares finds itself caught in a terrible trap. Seeing there is no hope, panic overtakes them and a crushed Ares watches as his once mighty army flee for their very lives! 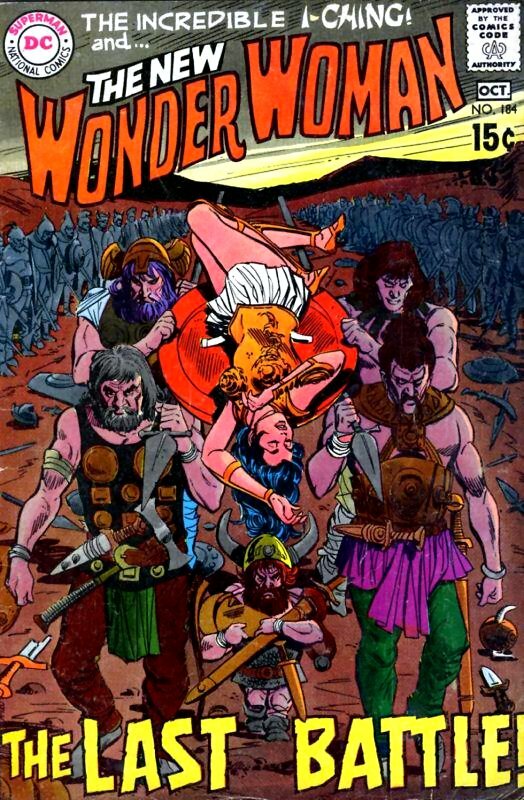 As the Amazons celebrate their victory Hippolyta appears, having awakened from her enchanted sleep. She worriedly asks where Diana is and the joyous mood soon changes as a desperate search of the battlefield takes place. But the Amazon Princess is nowhere to be found. Suddenly they spot a party of Ares men, led by the War God himself, slowly walking towards them carrying aloft a shield upon which lies the lifeless form of Diana! For a heart clutching moment Hippolyta fears that her daughter has paid for their victory with her life. 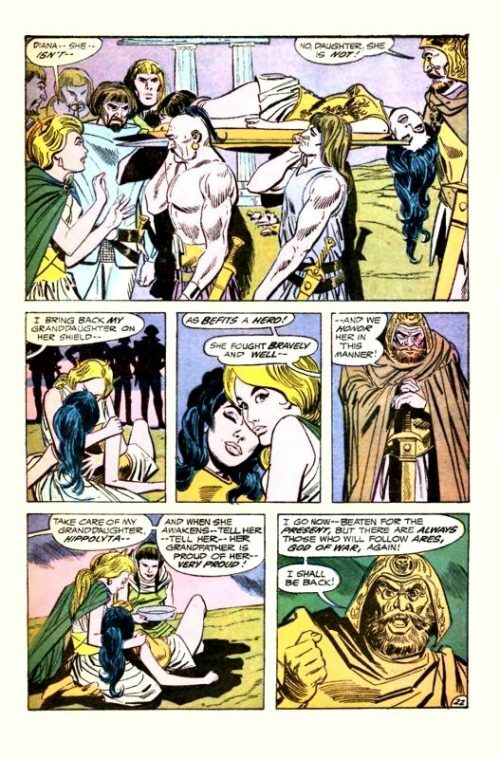 But Ares assures her that Diana is alive. As Hippolyta hugs her unconscious daughter, Ares tells her that he has brought his granddaughter back on his own shield as befits a hero. She fought bravely today and they honour her accordingly. He tells the Amazon Queen to take care of his granddaughter and when she awakens, to tell her that her grandfather is very proud of her. Ares then tells the assembled throng that he will leave now, defeated for the present, but that there are always others who will follow Ares and he shall return someday with a new army to finish what he has started. A few minutes later Diana regains consciousness and is overjoyed to find herself in the arms of her mother. A smiling Hippolyta congratulates her daughter on her victory over Ares. The other heroes then step forward and thank Diana for waking them up to their responsibilities. If she ever needs them again she need only ask. They then bid her farewell and depart back to their own world. Over the next few days as Diana quickly recovers from her wounds and exhaustion, she and her mother watch as Paradise Island is slowly rebuilt to its former glory. But soon the hour of parting comes and mother and daughter embrace lovingly, saying their goodbyes. I Ching tells Diana that he wishes to stay here for a while longer in order to study some of the ancient mysteries to be found here and that he will join her back on Earth later. Once again, Druscilla the messenger leads Diana back through the dimensional portal and to Earth. Diana bids farewell to Druscilla and watches her depart before stepping inside the darkness of her long closed Clothes Boutique. She is confronted by a young girl staring out of the gloom, whose face momentarily holds an expression of stark terror. The relieved girl stammers “Oh! Dear God…I thought you were them!”.